Theme #2: What is the composition of Mars' crust? Science Background: Like the other terrestrial planets, Mars contains an outer layer, or crust, that is chemically distinct from the underlying mantle. Earth and Moon both have crusts with more lightweight aluminum-rich minerals and less iron- and magnesium-rich minerals than the underlying mantle. The Moon in particular has a very aluminum-rich crust, exposed in its light-colored highlands, that is thought to have formed by flotation of plagioclase feldspar on a magma ocean. That feldspar-rich crust, a kind of rock called anorthosite, is only thinly covered by dark volcanic basalt in the lunar maria. 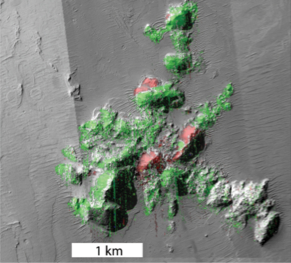 From analysis of Martian meteorites, Mars' crust is thought to have formed mostly of basalt. Crustal mineralogy records the thermal history of Mars - how the planet has shed heat and cooled over eons by erupting igneous rock. It also records chemical alteration of igneous rocks by water and transport of rock fragments by fluvial (river), lacustrine (lake), and eolian (wind) processes. In that way, a small fraction of the volcanic crust is reshaped into sedimentary rock. The third major class of rocks is metamorphic rock. Prior to MRO, the type and distribution of metamorphic rock on Mars was hardly even considered. Understanding the composition of Mars' crust and how it changed with time tells us about many aspects of Mars' evolution as a planet, and is a major goal of CRISM. The Pre-CRISM view: Remote and landed measurements prior to CRISM, and analysis of Martian meteorites, all suggest that the Martian crust is made mostly of basaltic igneous rock composed mostly of feldspar and pyroxene. Images from the Mars Orbiter Camera on MGS showed that in some places the upper few kilometers of the crust is composed of hundreds of thin volcanic lava flows. TES and THEMIS both found mostly basaltic igneous rock, with scattered olivine-rich and even some quartz-rich rocks. OMEGA found that the crust also contains a very limited amount of phyllosilicate- and sulfate-rich rocks, highly concentrated in Valles Marineris and Terra Arabia. Question 2.1: How much sedimentary and metamorphic rock occurs in Mars' crust? The first recognition of widespread sedimentary rock on Mars came from the Mars Orbiter Camera which found that several areas of the planet - including Valles Marineris and Terra Arabia - have horizontally layered, light-toned rocks. Follow-up observations of those rocks' mineralogy by OMEGA found that some are rich in sulfate minerals, and that other layered rocks around Mawrth Vallis are rich in phyllosilicates. Both class of minerals are signatures of sedimentary rocks. CRISM has used its improved spatial resolution to look for new deposits of sedimentary rock on Mars' surface, and for layers of sedimentary rock buried between layers of volcanic rock in Mars' crust. Discovery - diverse sedimentary rock, but little buried at great depth: CRISM has discovered that sedimentary rock formations containing aqueous minerals cover much greater areas and are more compositionally diverse than previously thought. For example, outlying occurrences of the sulfate-rich rocks in western Arabia that were explored by the MER/Opportunity rover extend hundreds of kilometers into eastern Arabia. Remnants of the clay-rich rocks around Mawrth Vallis cover nearly one million square kilometers, and comparable rocks are scattered around the planet. Most surprisingly, surrounding Valles Marineris there is a sedimentary rock formation a few tens of meters thick with layers of opal and dry stream channels. However, in images of rocks exposed from one kilometer or more in depth, CRISM has found scant evidence for more sedimentary rocks buried by volcanic lavas. Apparently, most of Mars' sedimentary rock is still preserved near the surface. 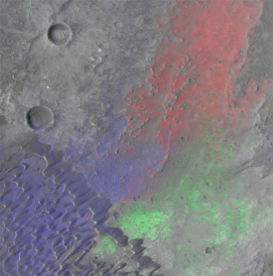 The false color CRISM image at left and the HiRISE image at right (at the location of the white rectangle) show a thin sedimentary rock formation that surrounds Valles Marineris. Some of the sedimentary layers are rich in opal, a hydrated, non-crystalline relative of quartz that formed in an ancient wet environment. Discovery - globally distributed metamorphic rock: One of the biggest surprises from CRISM is the discovery of widespread metamorphic rock, in which basalt or olivine-rich rock has been altered to new minerals. Common alteration minerals include silica, chlorite, and zeolite. All of these minerals form at lower temperatures and pressures than were experienced by much of Earth's metamorphic rock, which commonly contains mica, garnet, and amphibole. Mars' crust, instead, exhibits low-grade metamorphism. However, its metamorphic rocks are widespread. Where Noachian-aged materials are exposed from depth, the new mineral phases usually occur - in craters in the highlands, in the walls of Valles Marineris, and even in impact basins that expose Noachian rocks buried below the northern plains. The new metamorphic minerals typically didn't completely replace the basaltic rock, another piece of evidence that although metamorphism was widespread, it was limited in intensity. This false color composite of CRISM and Context Imager images shows different compositions of low-grade metamorphic rock excavated by a 25-kilometer highlands crater. Silica appears magenta, zeolite red, and iron-magnesium phyllosilicate minerals (clays and chlorite) green. Question 2.2: How much has Mars' crust been altered by hydrothermal activity? The circulation of hot water in Mars' crust, a process known as hydrothermal activity, would have implications touching on Mars' thermal evolution and past habitability by life. Hydrothermal circulation would have been an efficient way to cool and thicken Mars' stiff outer layer - its lithosphere - influencing how tectonic features formed. Hydrothermally altered rock could represent the deep "roots" of what once were hot springs, and provide clues to where long-eroded hot springs might have been found. Discovery - scattered hydrothermal alteration: CRISM has discovered minerals that form in hydrothermal environments across many regions of Mars, where they have been exposed by erosion or impact craters. The mineral prehnite, which forms only at temperature and pressure consistent with pressurized superheated water, is exposed in several locations, most notably around the Argyre impact basin. Serpentine, which forms by alteration of olivine by hot water, is exposed in a number of different locations. The discovery of serpentine is exciting because its formation produces hydrogen gas, which can be an energy source for primitive microbes. This false color CRISM image of rock excavated from depth in the highlands by an impact crater shows basalt altered to different minerals. Areas in green are iron- and magnesium-rich clays, and areas in red have been altered by hydrothermal water to serpentine. Question 2.3: How did the composition of volcanic rocks change over time on Mars? the composition of rocks overlying the source region of the melt, that mix into magma as it rises to the planet's surface. The two most important sources of information about Mars' volcanic rocks have been landed measurements from the Mars Exploration Rovers, and meteorites from Mars. Each source is limited, though: the rovers have visited only tiny areas, and the geographic source regions of Martian meteorites are unknown. Using orbital data to understand Mars' volcanism is a developing field. Unlike looking for aqueous environments, where just the occurrence of a mineral is telling, to understand Mars' volcanism the critical measurement is abundances and chemistries of just a few key minerals (mainly feldspar, pyroxene, and olivine). Determining abundances of minerals from orbit is notoriousy difficult. Since the first orbital mineral detections in dark, basaltic regions of Mars by the Imaging Spectrometer for Mars on the Soviet Phobos 2 spacecraft, then by TES, THEMIS, OMEGA, and CRISM, it has been a huge challenge to get results that agree with landed measurements from rovers, and with global maps of elemental abundances measured by the Mars Odyssey gamma-ray spectrometer. OMEGA results show perhaps the best agreement with landed and elemental chemistry measurements. Pyroxene composition in basaltic rock has evolved over time, from less calcium-rich forms in the Noachian period to more calcium-rich forms in the Hesperian period, possibly indicating that as time progressed, a lesser and lesser fraction of the source region melted as the planet cooled. The oldest, Noachian volcanic rocks may have a greater content of olivine, again suggesting a warmer interior long ago. Compositionally evolved igneous rocks that are highly enriched in quartz and feldspar are rare. Discovery - Mars' earliest crust? : CRISM's unique contribution comes from its high spatial resolution. That capability has been used to study the oldest, most deeply buried volcanic rocks exposed in the central peaks of impact craters. Unlike most volcanic materials near the surface, some central peaks have abrupt compositional differences between adjacent igenous rocks. Some are nearly pure olivine, and some are nearly pure pyroxene. One way that these contrasting compositions could have formed next to each other is from settling of crystals within huge subsurface bodies of magma, as they cooled early in Mars' history. The resulting rocks, called "cumulates", are each very rich in a single mineral. 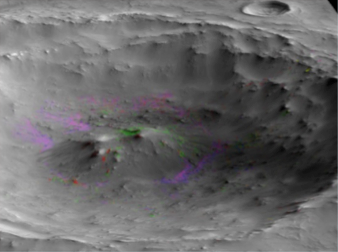 This false color composite of CRISM, HiRISE, and Context Imager images shows different igneous rock compositions in the central peak of Ostrov crater. Green areas are rich in low-calcium pyroxene, and red areas are rich in olivine. Discovery - anorthosite found (finally! ): A long-standing question has been where - and if - Mars had remnants of a plagioclase feldspar-rich crust like the one forming the lunar highlands. After years of searching, anorthosite was finally found in CRISM images. Only a few occurrences have been recognized, both in ancient highlands and in young volcanic rocks. The anorthosites are too scattered likely to have formed from a magma ocean. More likely, they formed where iron- and magnesium-rich minerals had settled out of magma bodies, leaving an aluminum- and feldspar-rich residue. 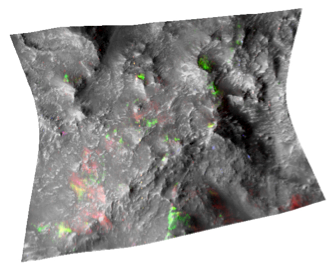 This false color CRISM image overlain on an MRO Context Imager image shows a variety of igneous rock compositions in the caldera of the Syrtis Major shield volcano. Basaltic rocks appear blue, olivine-rich rocks red, and anorthosite green. The small, bright, white spots at upper left are silica-rich. The two small craters at upper left are each about 1 kilometer in diameter.